One word for this is "BEAUTIFUL"! The colors are bold and bright, lights up the room. The material is the old-fashion quilt that Grandmother use to make with her leftover craps of material. It has an African look that makes you think you're on vacation! This multicolored patchwork quilted set boasts a modern take on the traditional patchwork technique. 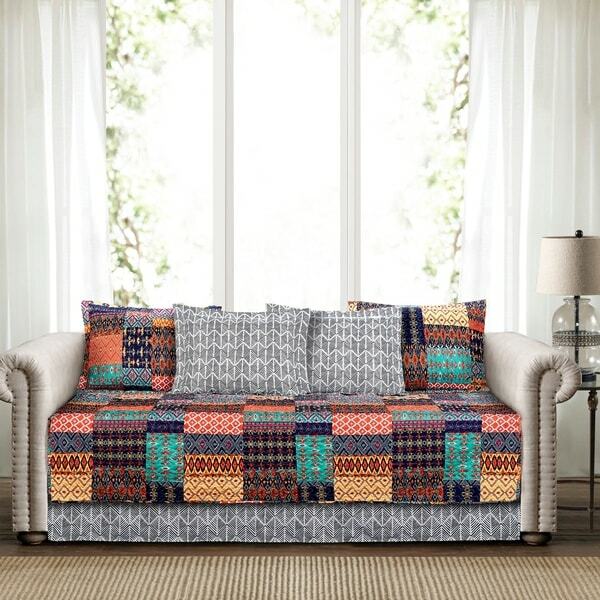 It is printed with lots of bold colors, pulled together with quilting details, and it includes two shams, two pillow cases, and a bed skirt, which round out the set for nearly any bedding ensemble. Care: Machine wash cold, with similar colors, gentle cycle. Use only non-chlorine bleach when needed.Tumble dry low, light iron if needed. Beautiful product! The colors are so vibrant and is a nice high quality piece. Looks just like the picture! Love the colors and the price! 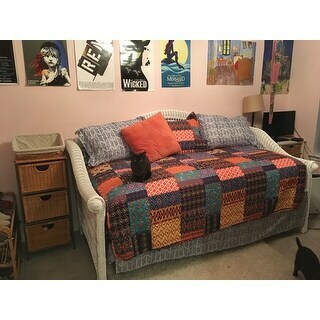 Using it on a trundle bed in a spare room! Matches just about everything!! Love this day bed pillowcases and light comforter. Beautiful colors. Very soft. Perfect for my daughters room. "Is the color black in the quilt? It’s hard to tell if it’s really navy or a combination of both. Thanks!" Its not black, its dark navy. Vibrant variety of colors and the sale price made it affordable. Everything You Need to Know about Daybed Bedding from Overstock.com. Our guides provide customers with information about daybed bedding.